History: It is the spring of 1941, and three girls from different countries come together: Mimi Jouvet of France - her only relative an uncle, a member of the Paris resistance; Lynn Drummond of England - the daughter of a British Naval Lieutenant; Marlene Meyer of Germany - her father was imprisoned for speaking out against Hitler. All are from different backgrounds, but all share two things in common: they were boarders at Clairmont School for Girls in unoccupied France, and they hated the Nazis. 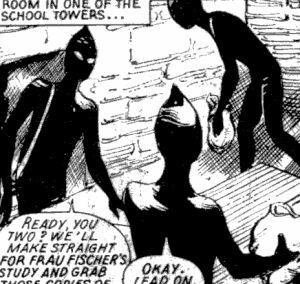 So when their school governess was replaced by a Nazi sympathiser, Frau Fischer, the three formed the Silent Shadows, a secret society which carried out missions against the Germans. Comments: Mimi is a skilled ventriloquist, able to convincingly throw her voice. 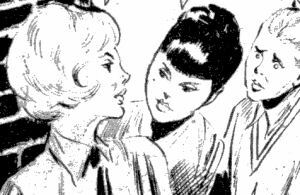 Otherwise the girls' had no powers, but were extremely resourceful. 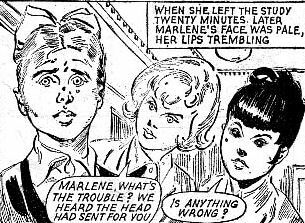 In the picture above, from left to right we have Marlene, Lynn and Mimi. 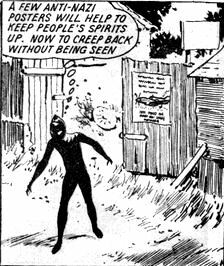 The Shadows' occasional contact was Jon Gilbey, a British secret agent.